Probably the best Council comment during Monday’s Comprehensive Plan discussion came from Ed Harrison. Ed, who often relates how his neighborhood straddles the Orange/Durham county border, explained how Durham has newly integrated a set of tools in its comprehensive plan to guide both developers and staff. The effort was spurred, Ed said, primarily by the planning staff, who wanted a better “planning toolbox” to manage the sprawling growth we often associate with Durham. That refresh complements the joint Durham County/City UDO (unified development ordinance) and extends beyond simply affirming base principles by integrating specific small area, transit and economic development initiatives and plans. During next week’s Council Planning Retreat, Ed’s colleagues should take a few moments ahead of time to review Durham’s work with an eye towards integrating “lessons well-learned” from our neighbor’s work into our own new effort. Chapel Hill’s AAA bond rating is noteworthy. The care our elected folks have taken to maintain it over a decade laudable. But is it fair to say, as Mayor Mark Kleinschmidt did yesterday, “it is almost, but not quite, as rare for a town our size to have a AAA rating by Standard & Poor’s and Moody as it is for Clemson to win in the Dean Dome”? Since early last year , the number of “AAA”-rated localities has more than doubled, according to a newly released Standard & Poor’s report. Over the last 1 ½ years, despite the withering economic downturn, changes in rating criteria combined with a number of first-time rated “gilt edge” communities served to produce an increase of 86 communities now rated in the top “AAA” category. Of the newly rated “AAAs,” S&P raised 65 from the “AA” category, with the remaining 21 representing communities never previously rated. Traditionally, rating agencies have been tightfisted in their willingness to assign “AAA” ratings to municipal debt. Now, 169 local governments carry S&P’s top rating, up from 70 in late 2006. Jay H. Abrams, FMS Bonds, Inc. In early April 2010, Fitch Ratings overhauled the way it assigns grades to the credit quality of state and local governments, recalibrating ratings on 40 states, the District of Columbia, the Virgin Islands and Puerto Rico. The move affects some 38,000 municipal bond issues. The rating agency’s wholesale recalibration is in part recognition that municipalities were being held to a higher standard than corporate and sovereign debt. Moody’s Investors Service also started to recalibrate its universe of municipal bond ratings in mid-April 2010, beginning with changes for 34 states and Puerto Rico. So, yes, the Town has managed to hold onto its AAA rating another year but the quality, so to speak, of today’s rating is not necessarily equivalent to that of the ratings awarded 2 or more years ago. As far as municipal bond ratings, recall that there are three dominant rating agencies (CRAs) who manage the market for ratings (little competition), they routinely make huge mistakes (all 3 rated Enron investment grade right up to the collapse, all 3 rated many of the bundled mortgage securities highly right up to their failures), they are slow to adapt and have a poor record of understanding how to value new trading instruments (like the ARRA Build America Bonds [BABs] our Town just issued). As I noted previously (most recently here) Chapel Hill’s Town Council has maxed out the credit card. The debt ceiling they have adopted is a reflection of previous borrowing decisions – not a prudent fiscal analysis of what is reasonably sustainable with our current tax-base. Electronic Municipal Market Access (EMMA) system – an analogue to the SEC’s EDGAR – to track filings. Chapel Hill’s recent $20.1 million filing, which includes the $16+ million for the Library expansion, is here. Comprehensive Plan – Compromise or Consensus? Last night Mike Collins and George Cianciolo (current and former heads of the Planning Board) laid out an interesting plan of action to move the Town’s planning process forward. Most importantly, they underlined the need for a more measurable, nuanced plan that works as an adjunct to the current Comprehensive Plan. Their plan also emphasized “consensus from all stakeholders” – a bit difficult if the members of the task force (if there is one) can’t compromise. Achieving compromise was one of the more difficult things the Sustainable Community Visioning Task Force faced given the wide diversity of interests and motivations expressed by the group. An unfortunate downside of a “consensus only” approach – key issues were not addressed because of vested interest in a particular outcome. Most notably, when a significant portion of the group pushed to make measurable goals and an acknowledgement of constraints to growth a key tenet, a couple of folks were able to derail that effort. With such a diverse membership and a widely divergent set of agendas, I expected the group to have difficulty coming to some kind of consensus which is why I proposed we first create a framework for discussing development trade-offs. I thought that we should create a decision-matrix that would factor out those things we could objectively measure, those things we could effectively estimate and those subjective things – like the value of natural beauty – which will probably forever be in the eye of the beholder. How do we measure those impacts (if they are measurable)? Are the consequences localized or not? Given limited local resources, what upper limit exists if we want to live within our own footprint? How much brown-field is available for redevelopment? Are there restrictions on redevelopment is an area based on the Town’s resource conservation or neighborhood conservation districts? 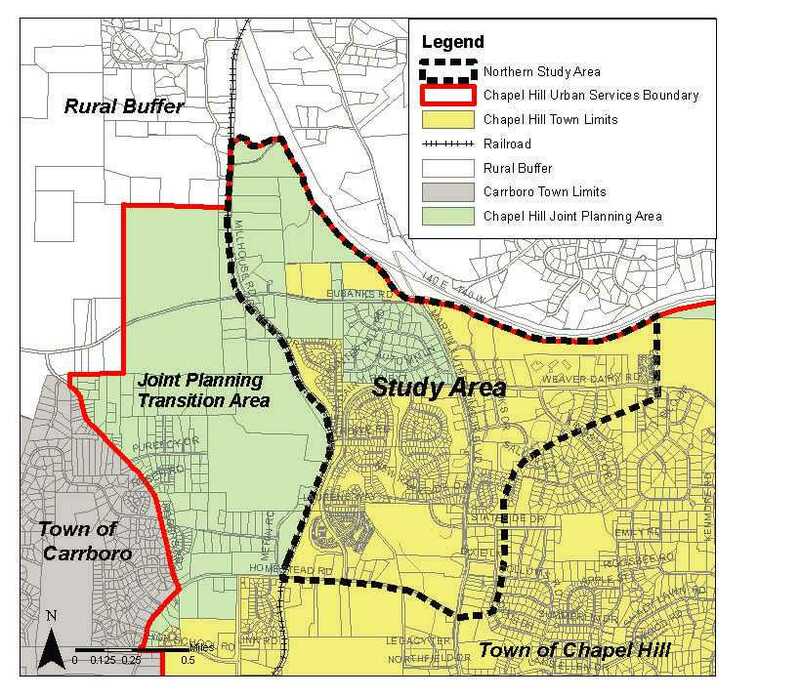 If we overlay all the restrictions imposed by conservation and watershed protection ordinances, by the LUMO (land-use management ordinance) and the underlying development zones, what does Chapel Hill look like? A very select minority of members, along with staff, did not want to create a decision-matrix to help the group find their way. There was some argument, for instance, whether measuring impacts mattered or if resources, like water, were a limiting factor when the community could purchase it from neighboring municipalities or draw if from Jordan Lake. Matt Czajkowski made the same argument last night when he said that the new effort would succeed if the membership had a way to discuss, evaluate, measure various trade-offs – to decide what course best to chart. For that, as he pointed out, consensus would be great but not required. Compromise, though, should fully be expected. Having gone through one recent iteration of this effort with the SCVTF, it is clear we must start from first principles – establish those elements which are measurable, those which aren’t – and create a clear process for working towards a consensus without requiring a consensus. Big agenda this evening. I also commented on the proposal for creating a range of housing options as a consequence of implementing the inclusionary zoning ordinance. Other folks commenting included Anita Badrock, Operations Manager of the Community Home Trust and Rob Reda, the local director of Habitat for Humanity. For the last 6 years, I have argued that our Town’s growing reliance on in lieu monies to sustain the affordable housing program was short-changing the community’s desire for more living space – especially family-oriented homes. I understand the occasional need for in lieu payments but as the Council scrambled to create the missing housing maintenance fund – that need seem to drive some unhealthy compromises made in approving projects like East54. It is far past time that the Council finds a way to fund the affordable housing program in a more consistent and predictable manner. Tonight’s proposal moves our Town one-step closer to that vision – codifying an emphasis on square footage – today’s housing – over accepting funds that rarely translates into affordable living space. I want to thank the Council tonight for making a substantive shift in policy that squarely prioritizes homes over programs. Thank you. While tonight’s recommendations represent a distinct change in course, I believe we can improve the proposal to help us meet both the needs of our current community and diversify access further. First, instead of expressing a preferences express priorities. What’s first, second, third when it comes to the goals the Town is trying to achieve? As far as off-site housing, please make it more acceptable than cash. Second, while I understand Robert and Delores concerns about moving housing stock, there should be a bias towards providing a different mix of housing – housing for our workforce – housing for folks – like my wife and I – who wanted to get their foot-in-the-door and establish long term roots in the community – housing for folks who already have deep roots in Chapel Hill – many who have served our community for decades – who want to or are being forced to downsize into more modest housing but want to and deserve to stay here. I was encouraged by Council member Ward’s recent call to review current utilization of the affordable units provided by developments like Greenbridge to see if we are meeting the goals our Town has set forth. As he put it – to tell if there’s a bias towards grad students over others. Third, to create a framework for deciding when off-site housing is preferable and should be prioritized. This framework would give specific guidance to developers for determining when such provision makes sense. I believe we can agree, in retrospect., that Greenbridge’s initial offer to provide housing off-site was probably the superior choice. I understand and fully support diversity efforts but as the character of development in Chapel Hill changes I believe that off-site units represent a choice that can better meet the needs of the wider community in some circumstances. The former and current Planning Board chairs made a concerted call for a long overdue refresh of the Town’s Comprehensive Plan. This refresh and elaboration on the existing plan is long overdue. I started calling for a re-evaluation 6 years ago when the original plan had an already scheduled a review of the underlying assumptions and requirements. Tonight former Sustainability Task Force members Del Snow, Madeline Jefferson and myself suggested a few ways to achieve a usable product in the not too distant future. I welcome the Council’s interest in refreshing the Comprehensive Plan – it’s been a long time coming. By 2004 it was obvious that the generic quality of many of the plan’s aspects were not achieving the goals originally expressed by the community. Anyone who has reviewed development applications over the last decade will note how the same language in the plan is copy-n-pasted into those applications to justify wildly divergent developments. In January, 2005 there was an effort to get the Council to refresh the comprehensive plan in light of the many changes going on in Town – including a move from the previously favored MVU type developments like Meadowmont and Southern Village to the more high density, multi-modal projects like East54. Council initially expressed support for the effort and by October, 2006 the Planning Board had made a series of recommendations which, unfortunately, ended up being rejected. Over the years since there have been several attempts to resuscitate that effort and – more importantly – fill in the gaps between the goals of a plan that, by necessity, remain broad and the need for more measurable requirements. Most recently, March 2010, part of the Sustainability Task Force called for an effort to not only review some of the tenets in the plan (Sustainability Task Force: The Whole or The Sum of the Parts?) but to look at introducing a further level of refinement – including objectively measurable goals and a core recognition that there are constraints to growth. Now, nearly a year later, it appears the Council is ready to move forward. I’m a bit concerned that Council will rely on internal staff and consultancies to drive the process. Whatever you decide the community must play the dominant role in moving forward. The current plan is quite broad, has a lot of moving parts, took years to formulate. I strongly suggest that while we remain aware of the inter-play between various components that the refresh is broken into distinct parts. Council needs to prioritize and set clear expectations while also dividing the work into pieces that can be dealt with in a timely way – in a way that will have direct impact sooner than later. Having said that, I also remind you of what Amy, Del, Madeline and I said last March: look at the big picture, provide specificity, acknowledge constraints and plan from the beginning for iterative community input. Finally, we can no longer pretend what happens in one part of the community doesn’t affect another part. Development impacts do spread beyond the property line. We, the citizens of Chapel Hill are all in this together – so as we develop small area plans for Ephesus Church Rd. or development agreements for Glen Lennox or revisions in zoning for Obey’s Creek, these efforts must mesh with the new set of planning tools and approaches called for by the Planning Board and former members of the SCVTF. First big meeting of 2011 and, pre-meeting, an example of how Chapel Hill’s community expresses democracy in one of the purest forms as ten Raging Grannies filed in singing “We will not be moved…”. They and about 20 other supporters are here to remind Council that concerns over the Clark-Bigelow dismissal. This concerted effort sends a clear message – the underlying tensions still exist because the reasons still exist and they won’t go away without a clear and open review. That could start by supporting the two workers request to have a public review hearing of their case. Tom Monk steps up to the podium. “The Town generally does a good job with sanitation – things smell good – this doesn’t smell good.” Asks for the men to receive unemployment benefits. Samuel Monk chimes in – “this is a case where the workers have been discriminated against” because of labor organization efforts. John Heuer concerned about reports of dismissal calls for unemployment benefits. Wes Hare steps up – came here when Howard Lee was Mayor – he’s been part of the problem for forty years. It just doesn’t make sense, from what he hears from the folks he trusts this is a mess. Agrees with Monk that “this does stink”. Michelle Laws – reflects on what Mayor Kleinschmidt said in State of the Town and the reality of town. Believes we are following national trend of two nations – one white, one black. We are moving towards two towns – one minority, one white. One rich, one poor. Heard nothing about the poor, the low wage worker, the two towns. Back to Bigelow/Clark – can’t believe that they were fired during the worst recession since the Depression – left with little financial support. Calls out Town on unemployment benefits – says that inspite of protestations of not intervening the lawyer representing the two has received a pile of documents from the unemployment commission that clearly was aimed at dissuading the commission from granting aid. Robert Campbell – “I come tonight to call for justice…” I come tonight seeking justice for the two workers – it is about human rights and doing the right thing. “I thought scrooge was dead” but in the middle of the holidays we fire these two because of the outcry of one citizen. Since when do we allow one citizen to start a process that deprives the two of their due process. “I don’t need to remind of what happen yesterday….” in the ’70’s when a black student was killed and Chapel Hill was fire bombed…. Kerry Bigelow – Holds sign up that says “I am a Man”. Thanks for support of the folks that turned out. Disappointed on citizens who aren’t paying attention. They [“the Council”] count on citizens “on the sideline” being asleep. It is time for folks to get off the side-lines. His daughter gets up and asks Council to “get on the right side of history”. Steve Bader – Emphasizes there is no legal requirement for the Town to send the ESC a pile of documents. Many employers don’t send any documentation. Also asks that the Town doesn’t send any managers or staff to the ESC hearing being held in two days. Says someone in Town has violated rules by signing a contract they shouldn’t of – including 10’s of complaints – no movement on that – but on one citizen’s complaint these two were discharged. “These two brothers were stewards” – they were trying to be good stewards of the Town. If the Town doesn’t show up Thursday then they will get their benefits. Why are we just hearing today about an ombudsman – that’s a crime. MiriamThompson – “We elected you” – we didn’t hire the Town Manager, you did. A Town Manager that hires a notorious union busting group like CAI – who created a bias report. We didn’t hire a Town Manager that hasn’t let the employees confront their accuser. You were elected to support all of us…let’s not enter the year with a stain on our hearts…..